Culinary arts never stop evolving, always finding new boundaries and unveiling new standards of creativity and world-class excellence. The students at First Gourmet Academy are at the forefront of this vibrant industry. Our expanded culinary arts curriculum, based on a comprehensive coverage of classical cuisines, will get you there. We offer a focused culinary arts program designed to propel you into the workplace after one year. In just a few months, we teach you what other schools take years to teach. It’s all about personalized attention to our students, constant feedback, hands-on repetition and constructive reinforcement so that each carefully planned lesson becomes an experience. It works, and it will work for you. 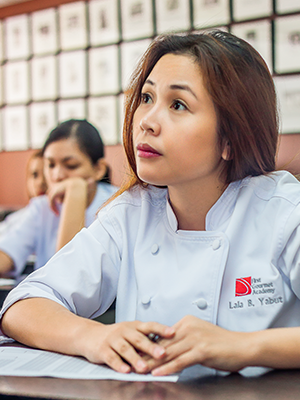 With more hours devoted to the subjects than other culinary schools, we can assure our students of an in-depth exposure to the culinary arts, designed to equip future chefs with all the basic knowledge they need to pursue a career in the culinary arts.